1. The electrical (voltage and current) requirements. 2. For flying model aircraft, we also must take into account the weight of our propulsion system (battery, motor, gearbox, prop), and the desired performance from the model aircraft (wing loading, flying speed, duration). Most motor manufacturers indicate the amperage a motor will use at a given Voltage. If your motor does not have these specifications available you may need to measure it. To measure the current that your motor uses you will need a ammeter or multimeter in series with the motor as shown in the drawing below. It is important to measure the motor with the propeller you will be using, as the load will change with different propellers. You can measure the maximum current draw, and use this number as a guide to select an appropriate battery or pack. There are also specialized watt meters available from several different manufactures, These will also work well. 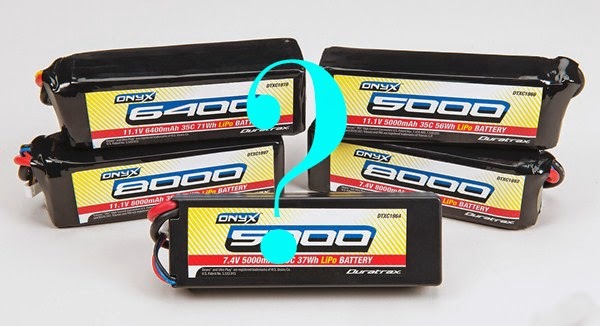 Once the current (amperage) requirements are known, it is possible to calculate the batteries needed. As an example if we check out the GB05 gearbox with a 3222 prop installed, The motor on this propulsion unit is rated for 3V (volts), and we can supply that with a single lithium polymer cell (which gives us about 3.7V nominal voltage, you might measure the voltage to be 4.2V with no load) we find that we draw about 170mA (milliAmps) current at full throttle with this setup. So now we know that we must choose a cell that can deliver 170mA of current. The discharge rate of lithium polymer cells can be stated in units of current (Amps), or often you will hear someone talk about "C". For instance, someone might say that his cell can be discharged at 10C rate. The "C" is the Capacity of the cell in "Amp Hours" or "milliAmp Hours". If you have a Plantraco LP90 lithium polymer cell with 90mAh capacity, we can discharge it at 90mA, and the cell will last about 1 hour. It's a simple calculation to do. In this case we would be discharging the cell at a "1C" discharge rate, or 90mA. It is noted in the specifications of the cell that it can handle a "10C" discharge rate. Wow, so that means we could discharge this cell at "10 times the capacity amperage" or 900mA. Almost 1 Amp from the tiny LP90 cell. Impressive! If we do this, how long will the battery last? Well that's easy, It will be 1/10 of an hour, or 6 minutes! Not very long to fly, but that's pushing the cell to it's maximum discharge rate. These calculations are estimates, but they are pretty close. So back to our GB05 propulsion unit, we can see that the LP90 cell can easily supply 170mA of current. 170mA of current here represents a "2C" discharge from the LP90 cell, so if we made a model that could fly with this LP90 cell and GB05 propulsion unit, it would fly for 1/2 of an hour - 30 minutes flying time at full throttle! Thats a long time. BUT, we are just getting started here, we want to fly a model aircraft, and now we have to consider the second part of the selection process - Weight and Performance. That LP90 cell weighs about 3 grams, the GB05 propulsion unit weighs about 1 gram or so. The airframe for the model, how much wing area does it have, and what does it weigh? How much thrust can we get from the 170mA consuming GB05 propulsion unit? The bottom line here is that depending on the airframe wing area and weight, that LP90 cell might make the aircraft too heavy to fly! So let's look at it again, what is the smallest cell we can get that can supply 170mA? The Plantraco LP20 cell (capacity 20mAh) can be discharged at 20C - that's 400mA! Amazing little cell. So if we discharge at 170mA that represents about a 8C or 9C discharge, let's just round off and call it 9C, (9 X 20mA = 180mA), so we'll be able to fly for 1/9 of an hour at full throttle! So that is about 6.5 minutes of flying time. I guess we can live with that duration - maybe when we fly, it will be with less than full throttle and we can extend the flying time past 10 minutes right? OK - so the LP20 cell weighs about 0.85g that's a third of the weight of the LP90 cell. I think we have found the cell we want to use for our flying model - less weight is always better. We found a cell that minimizes the weight, while still providing enough current to run the motor and actuators. This covers a little bit of the decision making process for choosing the right cell for your flying model. There are some other cases in which you will want to use a battery "pack" - 2 or more cells wired up in series or parallel, to get more capacity or more voltage - but that will be covered in another Plantraco Knowledge base document.